The new paper published in May issue of PLoS ONE documents a positive relationship between maize productivity in western Kenya and women’s empowerment in agriculture, measured using indicators derived from the abbreviated version of the Women’s Empowerment in Agriculture Index. Applying a cross-sectional instrumental-variable regression method to a data set of 707 maize farm households from western Kenya, authors find that women’s empowerment in agriculture significantly increases maize productivity. 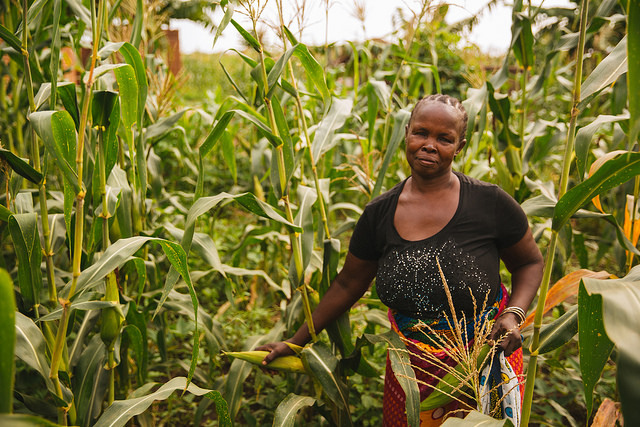 Although all indicators of women’s empowerment significantly increase productivity, there is no significant association between the women’s workload (amount of time spent working) and maize productivity. Furthermore, the results show heterogeneous effects with respect to women’s empowerment on maize productivity for farm plots managed jointly by a male and female and plots managed individually by only a male or female. More specifically, the results suggest that female- and male-managed plots experience significant improvements in productivity when the women who tend them are empowered. These findings provide evidence that women’s empowerment contributes not only to reducing the gender gap in agricultural productivity, but also to improving, specifically, productivity from farms managed by women. Thus, rural development interventions in Kenya that aim to increase agricultural productivity—and, by extension, improve food security and reduce poverty—could achieve greater impact by integrating women’s empowerment into existing and future projects. Authors acknowledge core funding to the International Centre of Insect Physiology and Ecology (icipe) provided by UK’s Department for International Development (DFID), the Swedish International Development Cooperation Agency (Sida), the Swiss Agency for Development and Cooperation (SDC), the German Federal Ministry for Economic Cooperation and Development (BMZ), and the Kenyan Government. The work on push—pull technology is funded primarily by the European Union, with additional support from the Biovision Foundation and the UK Government’s Department for International Development (DFID). At the time of the paper preparation, Greg Seymour was associate research fellow with the CGIAR Research Program on Policies, Institutions, and Markets (PIM) led by the International Food Policy Research Institute (IFPRI). His work on this project was funded by PIM and mapped to the PIM research portfolio under Cluster 6.1: Gender, Agricultural Productivity, and Rural Transformation. PIM has also been supporting work on Women’s Empowerment in Agriculture Index since its inception in 2012. PIM Webinar: The Women’s Empowerment in Agriculture Index – What have we learned?